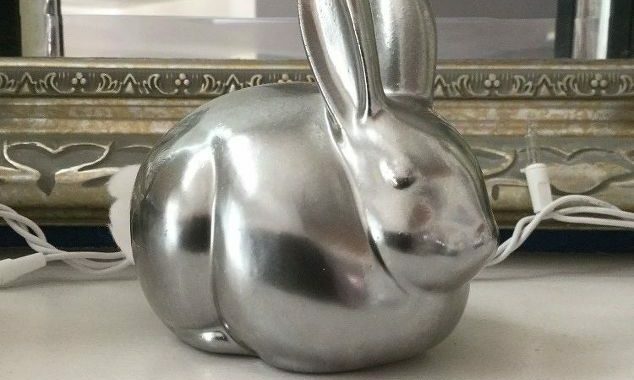 I found this ceramic bunny at the thrift store for $1 and I knew just how I wanted to upcycle him so he’d look like he was from Pottery Barn! 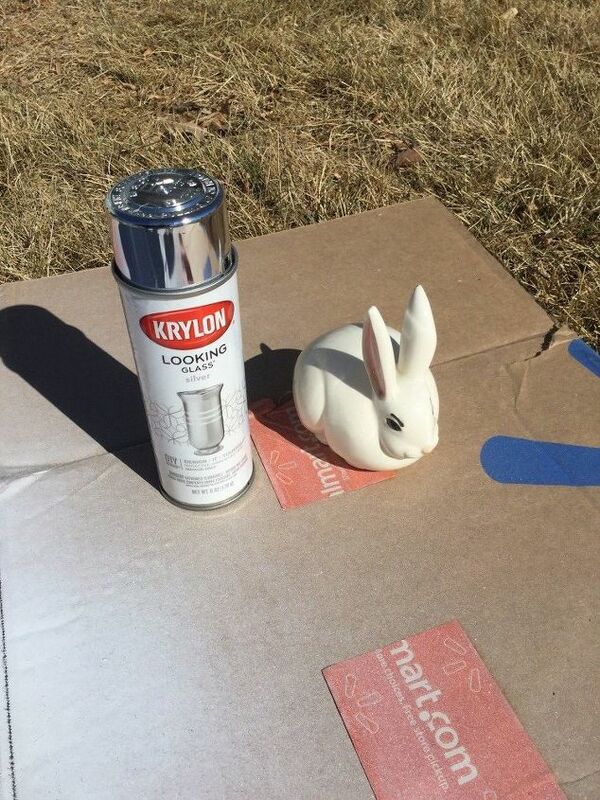 Follow the directions on the can and spray paint your bunny. Your bunny is finished. Pretty easy right? 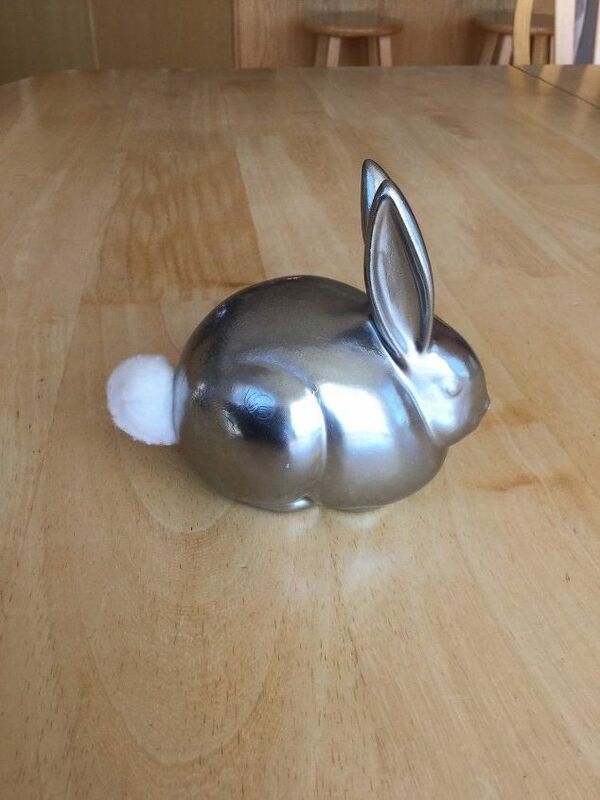 This ceramic bunny is a cotton ball dispenser. Great idea. 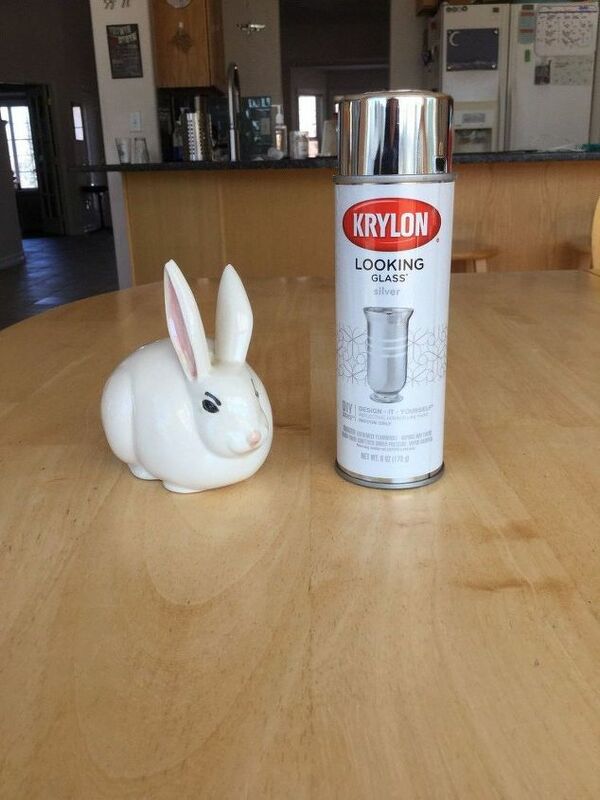 I purchased a bunny from the Family Dollar this week and planned to paint it. I have not decided what color, but sliver might me it. What a fun lil project! Adorable, cant believe it dispenses cotton balls, too cute! Super cute! 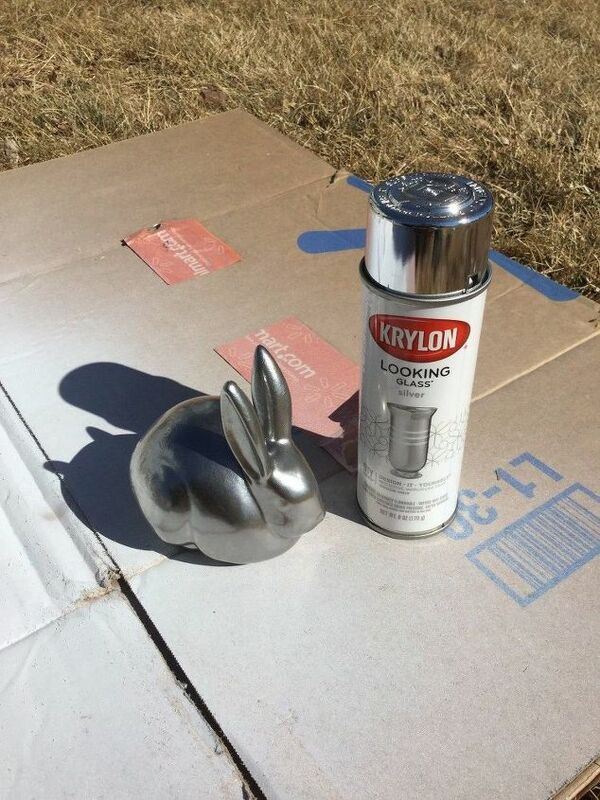 I have a thrift store bunny spray painting project coming up tomorrow! 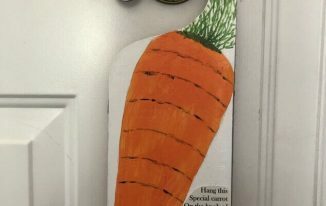 Great ideas for saving a bunny and looks great. 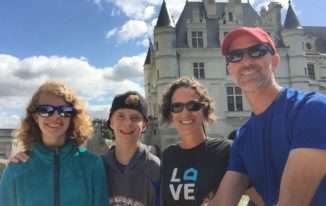 Found you on Happiness is Homemade Link Party. Thank you so much Tracy 🙂 I’m thrilled with how he turned out. 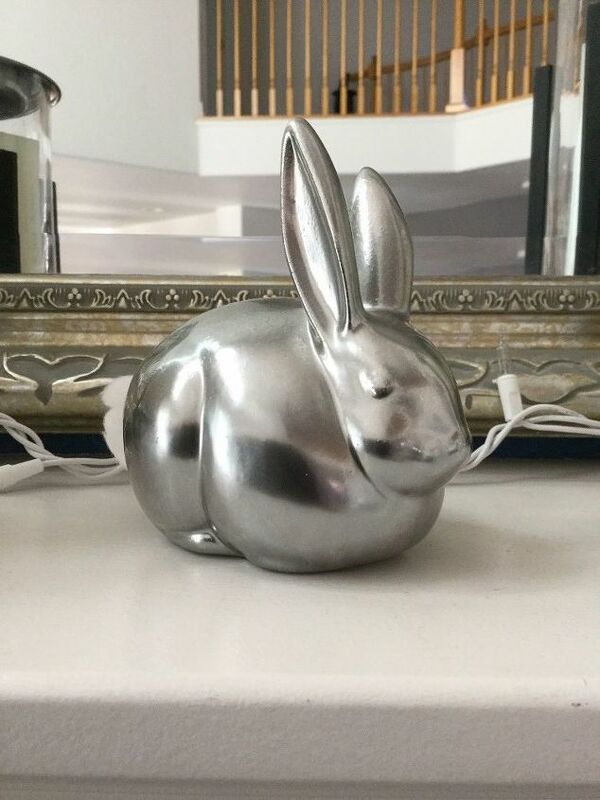 This chrome spray is fabulous, he looks great in his shiny new coat! Thank you so much Julie, and I’m enjoying him on my mantel for spring. Thank you very much Cheryl. I’m so pleased you liked both the post and the video. 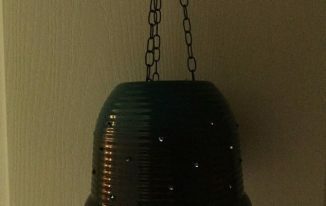 I love thrifting for the adventure of never knowing what you will find. I repaint figurines sometimes but never would have thought doing one like this… I LOVE IT! Now I need to go find a bunny lol. So cute. I love your bunny! What a change! I had a bunny with a broken ear when I unpacked this year and I just glued it on and then decoupaged him which hid the crack! Thanks for coming by and sharing at Celebrate Your Story! Thank you Chloe. 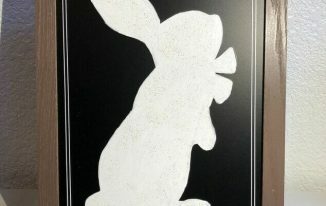 I had the same thing happen to one of my bunnies – and ear fell off. I glued mine too and then I made him gold to match this one… coming soon. Decoupage was a great idea and totally a great way to hide repairs. Great idea. Thank you so much Clearissa. I’m super pleased at how easy this was and how he turned out.